It seems that it is a common theme with older motorcycle finds on Craigslist that either the keys have been lost, or they don’t have a title for the motorcycle, or both. This bike had a clear title, but no keys, so on Day 2 of the bike project I began trying to figure out how to obtain keys for this motorcycle. 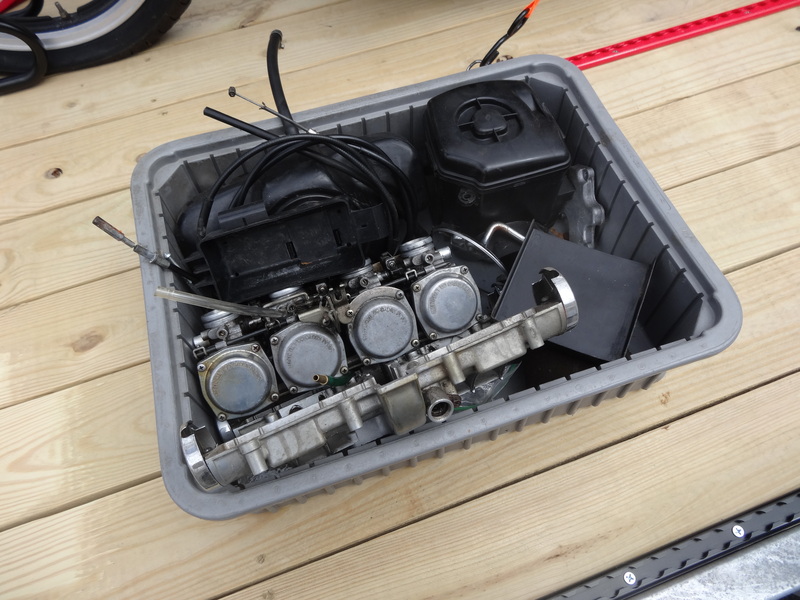 The key is required to start the bike of course, but also to remove the seat, the fuel tank cap, and the helmet lock which will allow proceeding with much of the other work. All of these locks should be keyed the same, so it is a matter of determining what the Key ID number is for this motorcycle. If you have purchased a new motorcycle or car recently, you probably received this number on a metal tag attached to your new keys with instructions to save the tag in a safe place in case you ever needed to get replacement keys. Not so lucky with the older vehicles. In this case it was a matter of removing one of the locks from the bike so that the Key ID number could be read off of the back of the lock. Of the locks available to check, it turns out that the ignition was the easiest to remove after removing the two bolts that hold on the headlight and then two 5mm Allen bolts that were holding in the ignition. 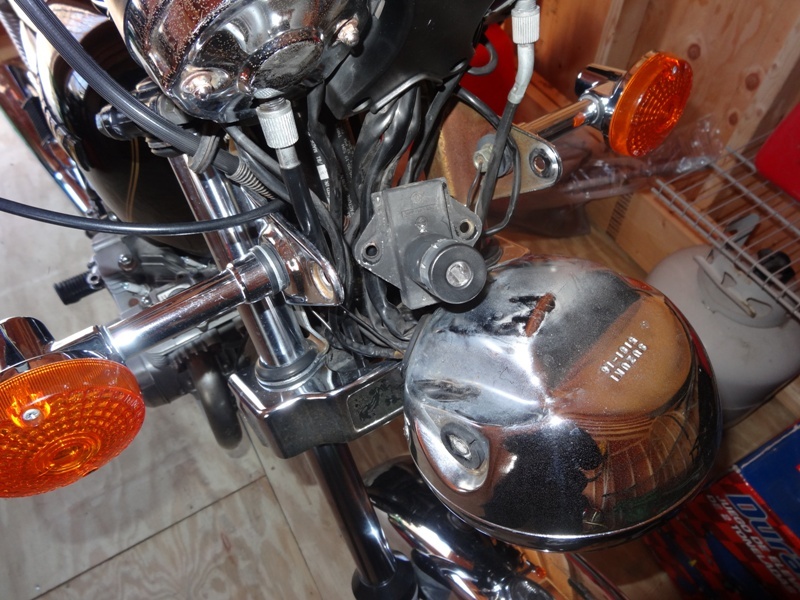 Here is the the headlight and ignition removed. 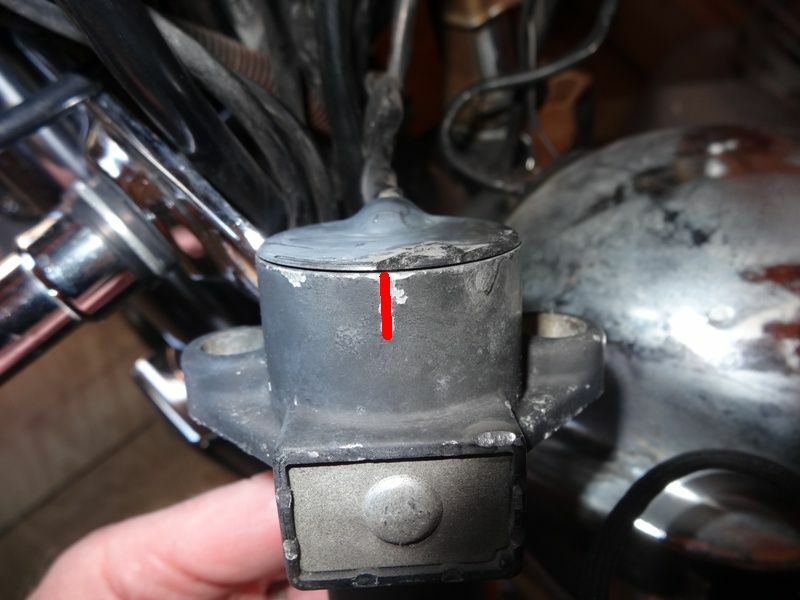 Once you have the ignition out, there is a very small number stamped on the case where the red line is shown. This is the Key ID number for all of the locks. Now it is a matter of finding the key and I was lucky to find http://motorcyclekeys.com/. I sent an e-mail to the owner, John, of this site and found that he still had in his possession an original, unused Suzuki key with the Key ID number that I needed. For $25 he dropped this original key along with a longer blank in the mail. After patiently waiting, I received the envelope in the mail today all the way from Hawaii. As you can guess, I went straight to the shed to see if the key would work. The original key did work in the tank, seat, and helmet lock so I know that the key is correct, but as John suspected it was too short to get into the ignition far enough which is why he included the longer blank. Of course, I then decided I should head to Lowe’s which was the closest place I could get a key cut at this time of day, but they refused since the blank was a different brand than their key cutting machine. Another weekend assignment coming up and potentially a future blog on how many ways I dislike Lowe’s. Update: I took the original key and blank to my local True Value Hardware today. Key was copied at no charge and we are good to go. 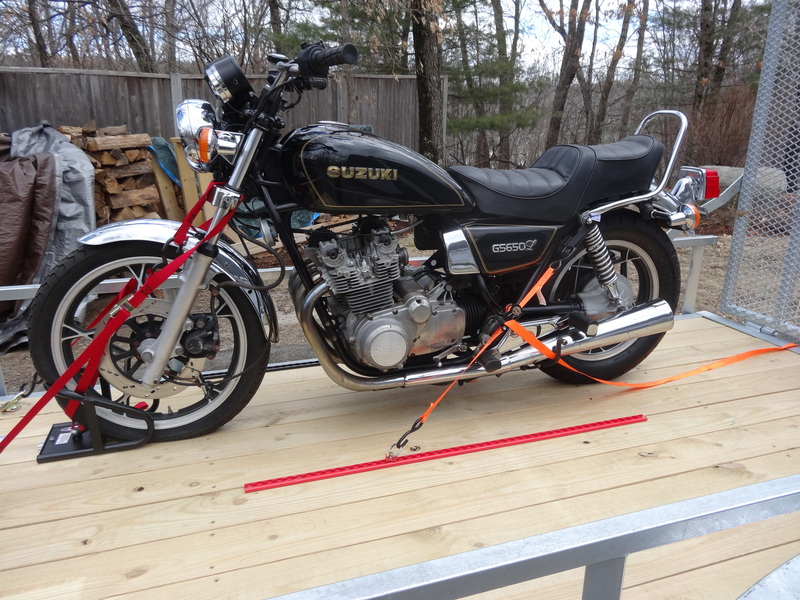 I just picked up this 1981 Suzuki GS650L from Craigslist as a project bike. Everything is original equipement except for the handlebars and it needs some work before it can get back on the road again. I plan to do the work myself and document my progress here. You can see from the first photos that there is plenty of work to be done. The guy that I bought this bike from has had it since 1991 and he was the third owner. His title for the bike indicates that it had 5,506 miles when he purchased it. The odometer now reads 26,896 miles which would be less than 1,000 miles per year. He rides a Vulcan 1500 now that has 70,000 miles on the odometer so I can’t believe that this bike only has 26,896 miles, but could it really be 126,896 miles? I would be surprised based on how everything looks from the outside. We will see when we start to look inside. The carburetors were removed for cleaning. The cam cover was removed for cleaning. Needs a new clutch cable. Front tire has a slow leak. Click on the Leave a Comment link under the post title if you would like to add to the discussion.